The Morris Elementary School District # 54 Board of Education and Staff welcomed Dr. Shannon M. Dudek as Superintendent of the School District in June of 2016. 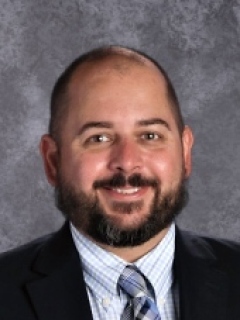 Dr. Dudek served previously as Superintendent of Pleasant Hill #69 School District in Peoria, Illinois, and Assistant Superintendent of Oak Grove #68 School District in Bartonville, Illinois. Dr. Dudek is a former principal, assistant principal, junior high Language Arts/Literature teacher, and a former basketball and baseball coach. Dr. Dudek completed his Doctoral work at Aurora University researching the impact of 1:1 technology and student success. He completed his undergraduate work at Western Illinois University and Educational Leadership graduate programs at Eastern Illinois University. Prior to entering public education, Dr. Dudek served in the United States Army, and he understands the impact public service has on a community. His priorities as Morris #54 Superintendent are ensuring school safety and leading a system of instruction that will prepare every student for successful life-long learning.